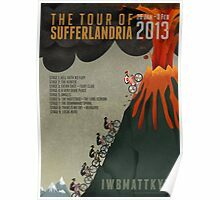 Official artwork for the 2013 edition of the world’s most difficult cycling tour in the world’s least hospitable country. Sponsored by TheSufferfest.com. Design by artist Gregory Baldwin. Art is in art-quality high resolution (higher than you are able to see on screen). Posters, cards, prints and framed/mounted prints are all available in a variety of sizes. 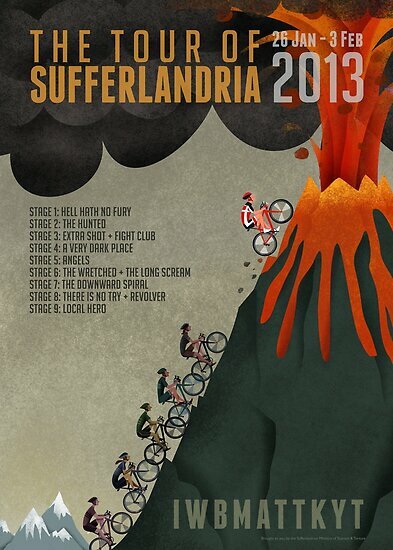 Email david@thesufferfest.com with any questions. 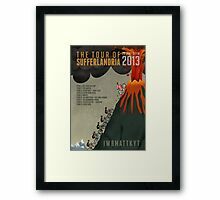 I purchased the 2013 Sufferfest poster and had it mounted and framed. Unfortunately the mounting did not stick and bubbled away making a bit of a mess. I am going to buy a second poster and have it redone. Should I forget the “mounting” part and just have it taped to the matt border? Have you mounted this poster successfully? The framing shop thought the paper was slightly waxy and so perhaps it was not suited for mounting. Could you please let me know how best to frame this very cool poster…mounted, unmounted or otherwise? Thank you from a fellow Sufferlandrian. Too late to see this poster in 2015 but it’s great!